A discussion about “Gita-The battle of the Worlds” a recently published children's book was held at the House of Lords on Monday. Authored by Sonal Sachdev Patel and in collaboration with Jemma Wayne Kattan, this book is an attempt at translating the actual text into a simplified version for the children here in the UK for whom understanding the dense language is a difficult process. The panel discussion included contributions from eminent personalities including – Lord Dolar Popat, Baroness Usha Prashar CBE, Lord Hameed CBE, Justin Cohen (editor of Jewish News) among others. This became her starting point and she then approached Jemma who has prior experience of being a journalist and a passion for story-telling decided to collaborate with her on this project. And being a mother of two children and a third child due in a few weeks, she became associated with this project on a personal level. “You know I remember of this one instance where we went shopping once and we were in the middle of a conflict about what to take and my 7-year-old child recounted one of the lessons of Gita reminding me how we should not give in to all our desires," said Jemma. At a time when anti-semitism and hate speech have found their weeds into the various spheres of public life, tolerance is one of the most talked about issues. And highlighting the importance of commonality and respectful dialogue Baroness Usha Prashar even recalled of a Ted Talk called “Decoding the Gita”. Praising the book, she went on to emphasize how basic values of love and respect should be passed down in practical light among children through integrated societies instead of restricting to simply passing theoretical knowledge. Lord Popat who hosted the event even highlighted the significance of the five principles that we draw from the Bhagvad Gita and how we should imbibe them in our children in their very upbringing and more so when social media platforms of Facebook are increasingly becoming a space for spreading hate and intolerance. 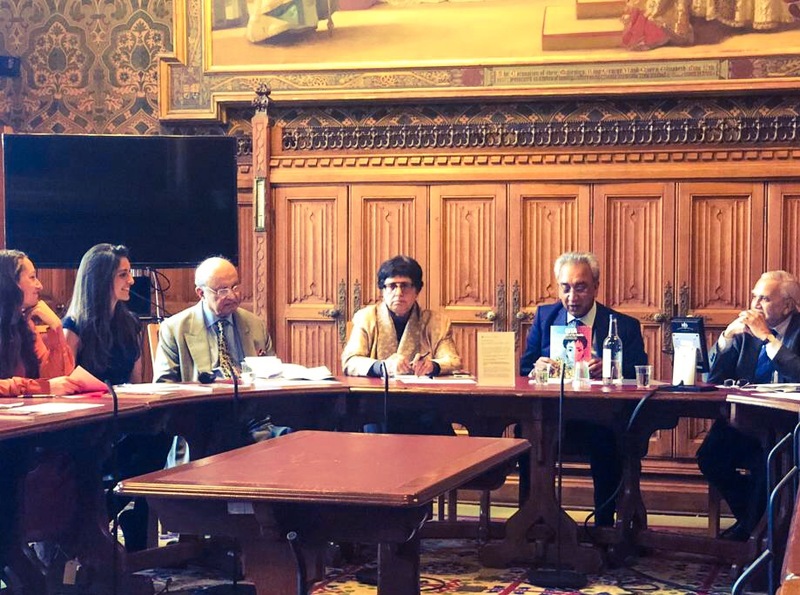 Lord Popat brought together both Jewish and Hindu community voices to discuss the book and shed light on the mythological and philosophical interpretations and ideas of the literature.